At first, I hesitated to order the MEAT AND POTATOES cookbook because over the course of the past six months I've changed my diet to a 'mostly vegetable' based diet. Where I used to eat meat seven days a week, I now have meat twice a week. However, my changing the frequency of eating meat has elevated its place. I expect more from the experience, I want it be special. Which is a perfect way to think about meat's place in our health conscious diet. 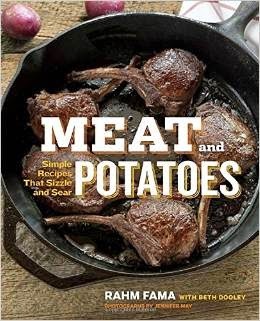 And luckily for us, Rahm Fama's cookbook: MEAT AND POTATOES meets that criteria with flying colors. Fama has created a cookbook of menus in which he takes familiar meat based dishes, puts a tasty twist on their preparation and then pares them with unique side dishes that will have you reaching for this cookbook the next time you want to impress your family with the comfort of meat and potatoes, but with healthy, taste-forward combinations. Using a slow cooker is my favorite way to prepare pulled pork...Fama's recipe gives turns the usual BBQ flavors on their head with the use of Hoisin sauce, balsamic vinegar, and pineapple juice. I also think that adding pear to slaw is inspired. A fun way to combine the popular waffle and fried chicken flavor combination. And as a big fan of collard greens, I can't wait to try Fama's recipe for collards with maple and bacon. In all, this is going to be my new go-to cookbook for the special days when I add meat into my diet. P.S. If you enjoy reading / crafting / cooking and FREE books, go to Blogging for Books and check out their wide selection of books available for review.